One of my favourite parts of Pam’s ABC Kits was the square leather frames she did for Jump (I know picking a favourite of these kits is like choosing a favourite child / pet). I loved the look of them, the simplicity, the elegance and yet the versatility. I have totally scraplifted / copied / been inspired by (call it what you like) them for a couple of things including a frame for a piccie of my son. 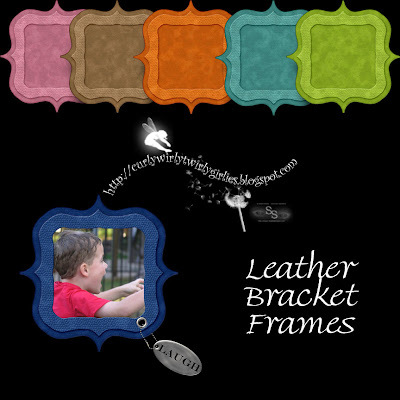 I love that the leather frames can have a metal eyelet in them, or ribbons and flowers on them (Pam’s piccie of her cute nephew the other day) and still look good. So whilst I was at it, I changed the colour a couple of times and made two in each of the kit colours. They are all bundled together because frankly I am lazy and can’t be bothered separating them out, making different previews etc etc. I am trying to wrestle control of the scanner back off my hubby’s computer which has taken over and won’t release it despite me closing all the programs GGGGGRRRRRR – this is the definition of frustration because I have found another button stash. Anyway grab the frames here, whilst I try the last resort of “simulated power failure” as I try and get my scanner back. Oh and if you are unsure how to cut the photo to sit in the frame because you are new to all this like me – I used the tutorial on Shauna’s blog, and it worked a treat (the one with the piccie of her and her friends). Funny story about the tutorials – whenever someone mentions the “marching ants” I get the Dora the Explorer song from the games / video stuck in my head “we’re the marching ants, we’re the marching ants . . . . . march march march march”. Bugger, now its back again. Thanks so much for all the wonderful goodies to coordinate with the ABC Kits. I'm also glad to hear that I'm not the only one that gets songs from kids shows stuck in my head from the silliest places! Thanks again! Thank you for these wonderful freebies. I love your designs. Erika - thanks so much for the link to my blog in your post! It takes your readers to my home page though (good for them though cause I have TONS of gorgeous freebies there today for them... but if they want a direct link to the tutorial that you mentioned, here it is! Thanks again and keep up the great work! I love your blog! Ok..so leaving the link didn't work! LOL how about this... if they go to the home page and click on TUTORIALS on my side bar...it's the second tutorial down! Yikes...almost 1:00 a.m. here and time for bed for me! LOL! Wow great button sets I just grabbed them all. Thanks again for another great add-on! !